The Sixties was an important decade for fashion because it was the first time in history that clothing was geared toward the youth market. Previously, fashion houses designed for the mature and elite members of society; however, during the enormous social and political revolution that transpired in the mid-Sixties, the power of the teenage and young adult market was too great to ignore. The music scene was the voice of this generation and heavily influenced the iconic fashions that were created during this decade. 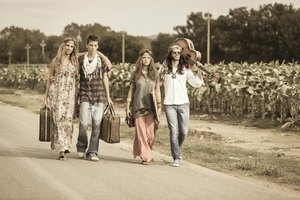 The first major fashion movement of the Sixties emerged from Great Britain, where The Beatles, The Rolling Stones and various other pop and rock bands were enjoying immense popularity. Designer Mary Quant created the iconic miniskirt in response to the youthful, fun-loving attitude that was spreading throughout the country. The capital became known as "Swinging London" and soon brightly colored streamlined fashions were all the rage in Europe and America . 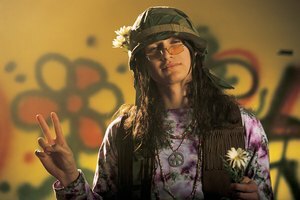 During the second half of the Sixties, the infamous Woodstock festival and artists like Jimi Hendrix and Janis Joplin influenced the "Hippie" movement that originated in San Francisco, Calif. The prevalence of free love, recreational drugs and psychedelic music became apparent in fashion. Clothes for men and women became loose and relaxed, with brightly colored prints and patterns influenced by other cultures. 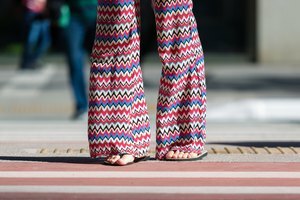 Bell-bottoms, tunic tops and tie-dye prints became very popular. The Sixties was a politically-charged decade and many folk artists emerged with their stance on war, racism and government. Bob Dylan, Tom Paxton and emerging star Joni Mitchell were important folk artists in the Sixties, and fans soon copied their fashion sense. Reflecting working class America, denim and military-style jackets along with western-inspired shirts rose in popularity.